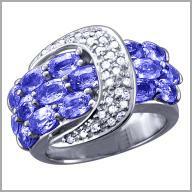 14K WG Sapphire & Diamond Buckle Ring,5.60ct sapphires and 0.26ct diamonds. Envelop your hand in whimsical sparkle and sophisticated allure. Crafted in 14K white gold, this ring features a buckle design with 16 oval cut 5 x 3mm pink or blue sapphires in two-prong settings. They are dazzled with 26 round cut diamonds in bead settings. There are cut-out stars on the back of the wide, cage-style band. With a setting size of 5/8" x 15/16", this piece has a total sapphire weight of 5.60ct and diamond weight of 0.26ct,G-H in color and SI in clarity.